Do you go to movies? If yes, then what is the latest film you watched? Did you buy a packed bottle from there? How much did you pay for one bottle? Let me guess; forty or fifty rupees. 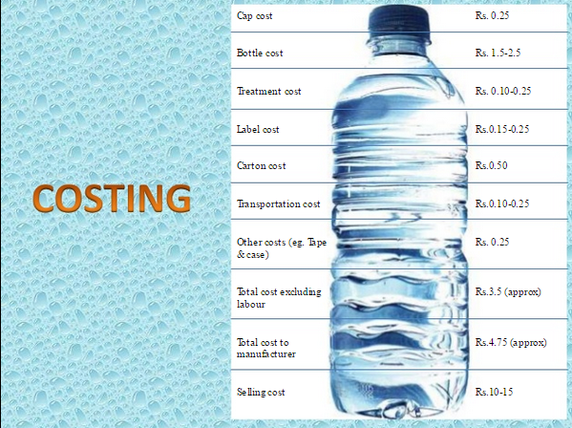 Have you ever wondered why do you have to pay so much money for packed water? If not, lets think about it. Do a search in Google with a keyword, "kinley water bottle cost". I am taking Kinley as an example here. Kinley is a product from Coco-cola Company. It costs around twenty rupees per bottle, what i mean from this is MRP. But if you buy from a mall, it costs from forty rupees to sixty rupees. This is illegal and should not be allowed. However this has been continuing as an accepted cost and surprisingly no one is protesting about it. I guess the major reason is the mindset of people. Someone is paying around one fifty rupees for a ticket to watch a movie, and why cant he/she pay sixty rupees for a bottle. Or is that person so miser trying to save little money of twenty rupees for a bottle. This kind of mindset helps looters to loot more. Highest price means no one has the authority to sell the product for a higher cost than MRP. I have seen people who seel juice and snaks also selling them for cost higher than MRP. This is also illegal. 1. Carry bottle from home to theater. It saves money as well as health as we don't know the quality of water in bottles. 2. The shop gives receipt for the water bottle. Check price written in the bottle and tell them the MRP [Maximum Retail Price] is this much only and they do not have a right to charge more. 3. Buy a bottle outside from mall. Go through the Quora to know more about the economic of mineral water bottle and why is priced as twenty.